Both spices and herbs are used to add flavor and taste to food. However, next time you are confused by that oriental cookbook you are trying, take a look at the subtle differences between herbs and spices. The most prominent difference between both of them is that herbs are leaves of herbaceous plants. Spices are, more often than not, derived from the roots, stalks, seeds or fruit of the plant. Though most people confuse the usage of the terms, technically speaking both are different. If you look at the biological differences, herbs refer to the plants that do not produce woody stalks. However, an exception to this rule is rosemary. They are usually found in temperate regions, while spices are usually found in the Far Eastern countries. Although spices like nutmeg, pepper and cloves originated in tropical countries, they are commonly found in most of the western countries today. Herbs are basically the leaves of herbaceous plants and are used for savory tastes and flavors in foods. However, they do have some medicinal value as well. When you are cooking up a culinary delight, you will in all probably use more of herbs than spices. This is because herbs are more subtle in flavor. Spices will usually have a much stronger flavor compared to herbs. Herbs owe their origin to such places as France, Italy and England. Technically speaking, herbs may also refer to herbaceous plants that die off at the end of the growing season; they may not refer to herbs used in cooking at all. Spices are more commonly available at warm and tropical countries and they can be a part of woody and herbaceous plants. Spices are also used to preserve foods at times, though that is not something you will find in herbs. You may also come across plants which are considered the source of both spices and herbs. For instance, the leaves of the cilantro plant are the herb, while the seeds are the spices. Another example of such a plant is the dill. 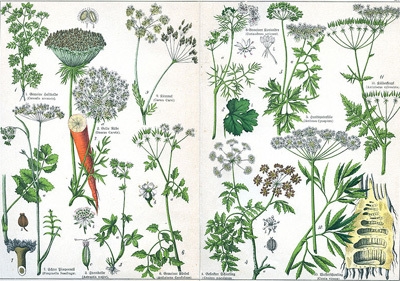 The seeds are the spice while the dill weed is derived from the stem or the leaves of the plant. There is another difference you might notice between spices and herbs. Since herbs originate in the temperate countries themselves, they will usually come across as inexpensive. You will not find spices readily available or inexpensive, even at places where you do find them. Herbs can usually be grown by the average gardener. However, spices need the perfect temperature and conditions to flourish. Before the invention of clinical medications, spices and herbs were commonly used to treat a variety of conditions. Even today, research has found that some of these are very helpful in controlling diseases. For instance, the anti cancer quality of turmeric is well known. However, it is a fact that rigorous scientific study is yet to be undertaken in these spices and herbs. Spices and herbs are not only used to add flavor to your food. They are also used in perfumes and for aroma therapy as well. Purpa Mukherjee. "Difference Between Herbs and Spices." DifferenceBetween.net. June 20, 2017 < http://www.differencebetween.net/science/difference-between-herbs-and-spices/ >.